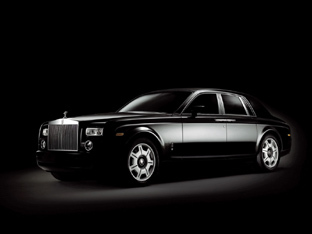 Rolls-Royce Motor Cars has hand built 25 Bespoke cars called Phantom Black. These special cars demonstrate the best in Rolls-Royce design, engineering and craftsmanship and emphasise the Phantom’s impressive performance and dynamic character. 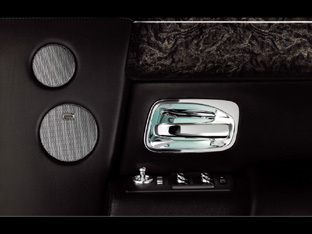 High lustre metallic Diamond Black paint is used on the body, complemented by twin silver coach lines. 21-inch alloy wheels come fitted with high performance Goodyear run flat tyres and feature unique black detailing and centre caps with RR badges, engineered to stay upright even at speed. At the rear of the Phantom Black, visible tail pipes hint at the car’s performance. 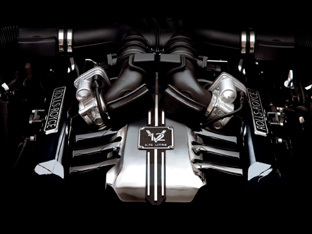 Under the bonnet the 6.75 litre V12 engine has been treated to gloss black inlet manifolds, chrome plated top covers and new black Rolls-Royce badges. The near silent motor provides 453bhp, enough to propel the Phantom Black from 0-60 mph in just 5.7 seconds and on to a limited top speed of 149mph.